This morning, I took the last pieces of Douglas fir firewood from the wood box, and Lisa hitched the pickup to the utility trailer and pulled the trailer around alongside the east fence opposite the box. After lunch, we kitted up and moved the wood from the trailer into the box. I'm much happier having the a full wood box. 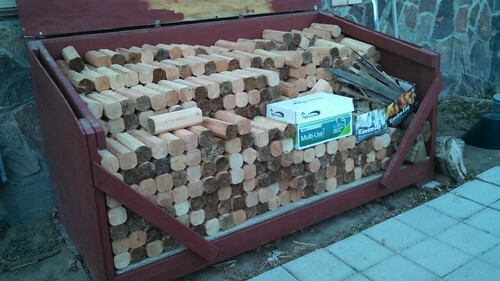 This supply will last us for perhaps a month depending on how cold it gets. I've been over-stoking the fireplace today in order to try and catch up for having no heat for the week we were in Southern California.